It’s been a hectic few weeks and finally, on a 9-hour flight to Canada for the 2018 Arc’teryx Rock Academy in Squamish, I found time to put down some words about the last few months. As an aside, some of the reason behind my tardy blog writing is that I have started as a monthly contributing writer for Rock and Ice Online as well as being fully immersed in a Nutrition Course (MNU). Alongside climbing, training, travelling, events and also having a (albeit marginal) social life, the blog has inevitably taken a back seat. My writing for Rock and Ice (two articles so far, here and here) has, so far, been a little more abstract and so although I will add them to my website once they have aired with R&I for a bit, they are a different species and don’t, I feel, replace the traditional blog format. The MNU course has been fantastic so far, I feel like a kid in a sweet shop of knowledge and learning! Having said that, it is definitely a case of the more you learn, the more you realise you don’t know! One questions leads to another five rather than an answer and I am constantly questioning my experiences, my current knowledge and my inherent biases based on them. 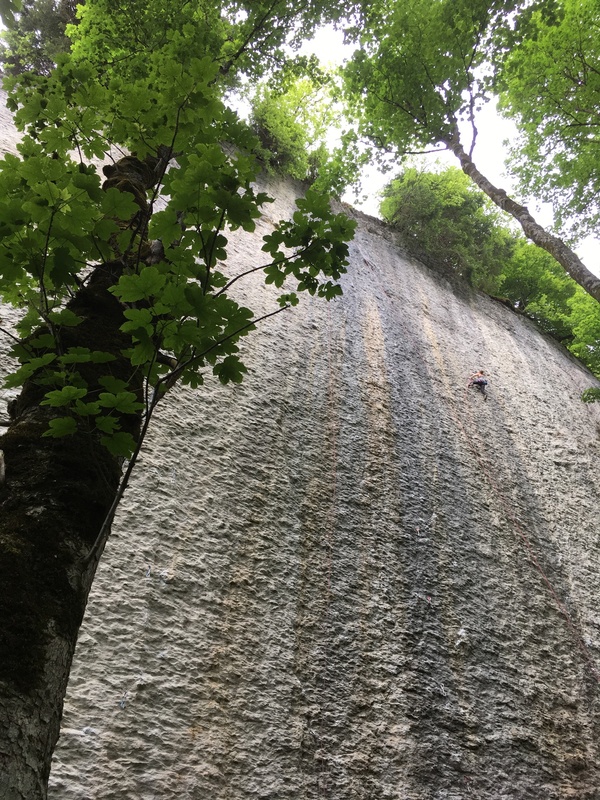 I spent about another 12-15 sessions on Rainshadow at Malham Cove this spring. Flipping loved being back trying hard, analysing, problem solving and putting in the time to get better on the route. It was really satisfying to see the winter’s work pay off in massive leaps of progress. The previous autumn was a weird one to say the least. I had felt strong on the route but spent a lot of the season recovering from the accident I had on it right at the start; both physically and mentally that time was mainly spent finding my stride again. So spring had a fair bit of anticipation for me personally. I was keen to get back on track, to make progress past where I had been before the accident. I realise looking back that I had reached the point where I needed to prove to myself that it was possible; there was only so long that I could realistically maintain motivation without the deep down feeling that I could do it. This spring gave me that. I could tell you the links I did, break down the route and go into the details, but I don’t think that is necessary (or perhaps that interesting unless you are a keen Malham goer). The basic progression was this: from “I think this might be possible” I moved to a place of “I can do this”. Subtle but huge. I still appreciate that I may not do the route; life has a way of interrupting and changing plans. But my underlying confidence and relationship with the possibility has shifted. Photo thanks to Liam Lonsdale. Having said that, I still need to be better than I am now. But that’s okay, I like working hard and getting better and I have some new approaches to physical training up my sleeve. I’ll put some time in again in the autumn but, with a less than ideal lead up in the summer (due to a little injury and also a lack of training consistency due to events and trips), I imagine the next big push will come in spring 2019. I’m looking forward to it already. Massive well done to Ryan, Buster and Pete who all sent the route this Spring – so inspirational, each of you for unique reasons. I spent a lot of days there with both Ryan and Buster and I’ll miss having them to try the route with moving forward! No doubt, I’ll be hitting you both up for continued advice. As is often the case with projecting, when your time is up, it’s really up! I went from my best sessions on Rainshadow to my worst within a week and I soon had to admit that it was time to shift the focus. 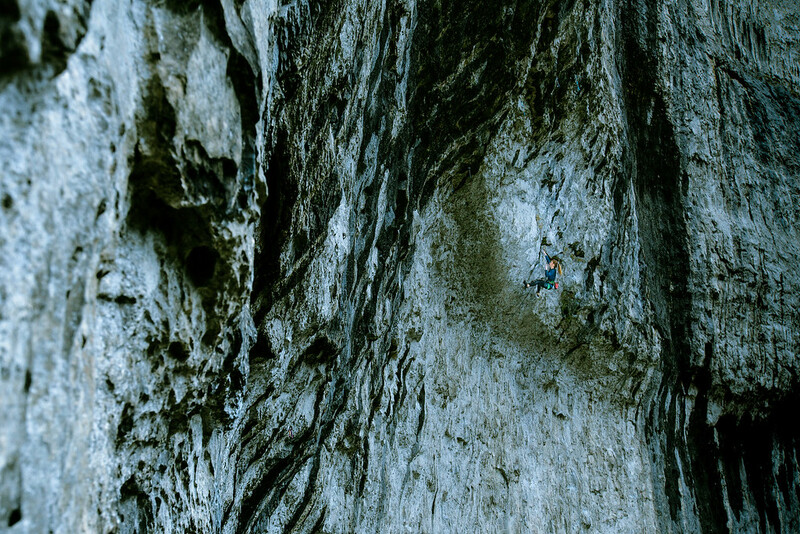 I did some classics in the UK and then set off for a quick trip to check out the sport-climbing venue of Voralpsee, Switzerland. 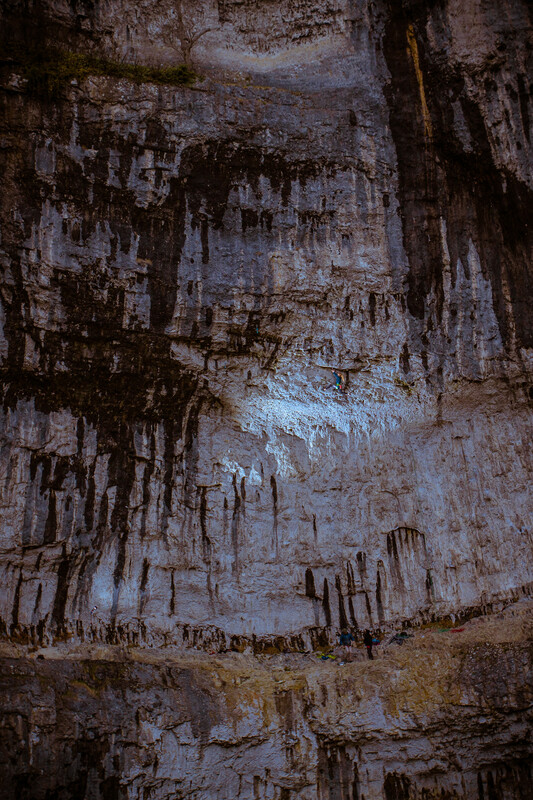 I have wanted to visit this crag for yonks and I was really excited to be heading there with a brilliant crew of psyched individuals: Ella, Ben, Ollie and Mark. Voralpsee is probably most well known for being the home of Speed, which had a notable ascent by Barbara Zangrel just two weeks before we arrived. 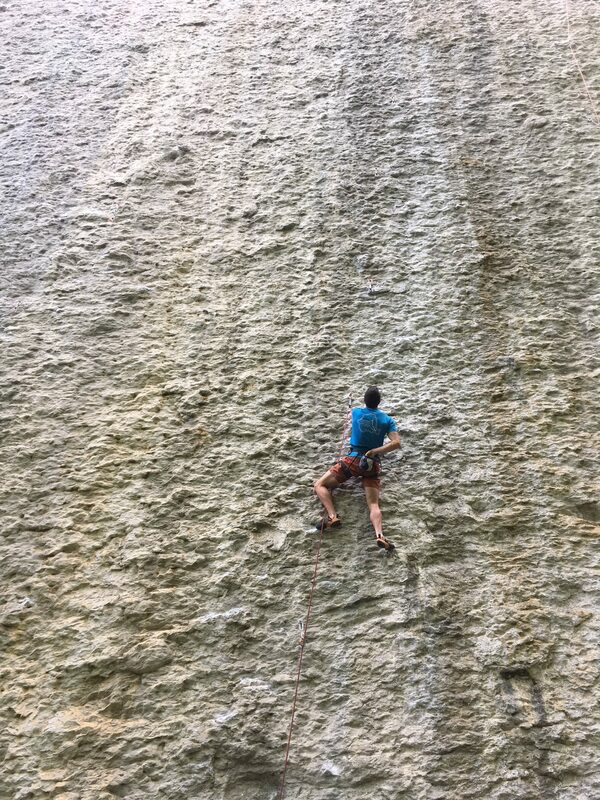 It’s hard to do justice to this beautiful limestone wall in words. It’s pretty staggering to look at and really cool to climb on. It’s a crimpy, endurance pump-fest with skin friendly holds, good movement, safe but exhilarating falls and it sits above a perfect lake to swim in at the end of the day. Ella in crush mode despite a pretty dodgy shoulder injury! We rented an air B and B in Wildhaus, a 25 minute drive from the crag and we soon settled into a routine: get up 7am (or 6am for extra keen points on the last day), do yoga, drink plenty of coffee on the balcony, drive our mini-commute, make the 25-30 minute walk to the crag and spend roughly 9am-4pm getting pumped out of our minds in the shade of the trees. 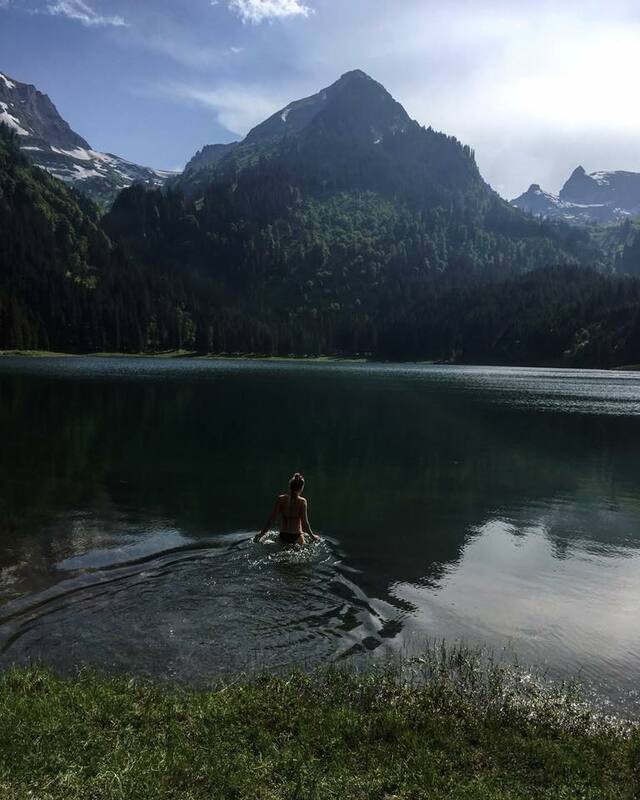 Then when the sun came onto the rock (which rendered everything near on impossible) we would stop climbing and head to the lake to swim in the cold water and dry off in the sun. Head back to HQ, make yummy food to eat on the balcony, chat away as the sun went down, early to bed. Repeat. Pretty perfect in my book. Mordillo, 8a+, photo thanks to Ella Russell. For those wanting more details on the crag and the climbing: most routes are about 35m, well bolted and good quality throughout. Grades range from 6bish -9a but the bulk of routes (and the best ones I think) sit in the 7c-8b/+ range. If you climb in this region of difficulty you will have plenty to go at for a short trip. The crag is not big (in terms of number of routes) but it’s hard to onsight as the rock is very white so you can’t see holds far ahead. There is a lot of planning and route reading as you go which gives the feeling that you have to be very over-strong/fit for a successful onsight. As a result, a few routes go a long way. 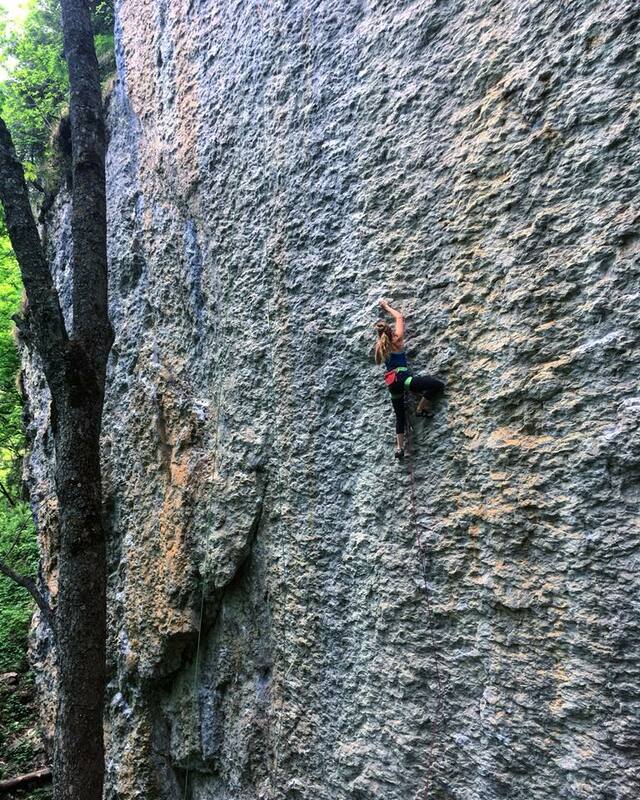 My favourite routes include Lucy 7c+, Mordillo 8a+, Alaska Kid 8a ,Grenzganger 8a and lastly Euphorie 8b/+ which denied me the send on the last day! More crimping on Mordillo, Photo thanks to Ella Russell Ben navigating a sea of crimps!